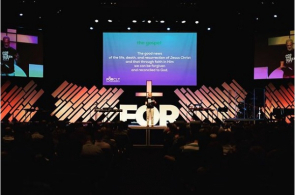 “This whole thing started for us just out of relationship,” said Chris Payne, the senior pastor of two vibrant churches that recently merged to become one congregation, in a phone interview with The Christian Post. Payne, 41, leads New Charlotte Church, which he and his wife started in their living room eight years ago, and Church at Charlotte, a 50-year-old congregation in the city. Originally intended for just their two churches, they started sharing the idea with their respective circles of friends who decided they also wanted to be a part of it too. A local network of pastors and churches, which happens to be called “For Charlotte” also got on board and asked Payne if they, too, could promote the sermon series to their network. Before long, 74 churches decided to participate and are preaching each of the messages on the first four Sundays in September. Payne re-emphasized that he wants the whole city to know that togetherness prevails across denominational and racial lines — that despite differences, the church really is unified on common message. “And sometimes our preferences get elevated above purpose. We kind of fall in love with our preferences and sometimes, even unintentionally, that becomes divisive and we separate because it,” he replied, when asked why he believes the American church on the whole seems plagued with unnecessary divisions. Pastors can fall into this trap, he added, and they do not always do a good job of building good friendships and community with other pastors who are different from us, but those relationships are where church unity starts. Payne’s church has also decided that even the community service activities they do will not be done alone; they always cooperate with other churches. Before the sermon series began earlier this month the participating pastors assembled just to pray. They spent about an hour-and-a-half interceding for the city and for the church together. He looked across the room and saw an older African-American lady who pastors a church in town alongside a middle-aged white man who leads another congregation holding hands praying together.